Are you tired of battling backache, slipped disc or sciatica or any other form of back pain? Allopathic treatment may help little to alleviate it. So try Yoga, as a lot of people have done and more are turning to yoga for a simple, yet effective and permanent way to get rid of the back pain. Understanding how pain is defined can be helpful in learning how to control it better. The term “chronic pain” is generally used to describe the pain that lasts more than three to six months, or beyond the point of tissue healing. A chronic back pain is seen affecting mostly the lower back, followed by the neck region and then the region between the shoulder blades. Long hours of sitting in car seats or office chairs cause the muscles surrounding and supporting the spinal column to remain contracted over a long period of time. If not taken care of, these muscles gradually go into a state of tight painful spasm. A chronic backache can be relieved by a little massage, applying heat to the affected part, relaxation and by a program of yogic kriyas aimed at increasing the functional capacity of the weak muscles. This is the back pain of sudden onset and agonizing severity, which renders the victim completely immobile and helpless. This pain strikes especially those leading a sedentary lifestyle characterized by lack of exercise and overweight, both of which contribute to functional inadequacy of the back muscles. The pain commonly arises after a trivial jolt or maybe even after a cough or sneeze. The first step to relieving acute back pain is to get into bed as soon as possible. Alternate hot and cold compress can be relieving for some as the next step. Even a gentle massage can be helpful. To prevent its recurrence, one should go for a yogic routine. Slipped Disc or Sciatica is the major form of a backache today. In both the cases the spinal nerves are put under pressure resulting in pain and if not taken care of, other complications. The disc is composed of the fibrous ring of tissues containing fluid and lies between the bony spinal vertebrae. The disc supports the vertebrae and allows movement of the spine to take place. A slipped disc is caused by prolapse of the disc substance. It can then press on the spinal cord causing backache. Prolapse is accompanied by swelling which generally subsides with time, allowing the disc to slip back into place. If the swelling is severe, the disc many remain prolapsed, interfering with the functions of the spinal cord and the mechanics of the joints of the vertebrae. This causes permanent weakening of the disc and if it has gone back into place, it may slip again due to the slightest strain or provocation. By adopting a yogic routine, one can strengthen the disc-related muscles and avoid the disc to slip again. In all the above cases, the regular practice of these six basic Yoga Poses with awareness can help in a great way to relieve the back pain along with strengthening the back muscles. These Asanas will remove the spasm from back muscles, particularly the lower back. The practice of these asanas will further help by removing the stagnant blood and replacing it with pure blood at the affected part. Makarasana is the best-suggested Yoga Pose for the patient recovering from a slipped disc or any other form of back pain. Makarasana is as good as a resting pose and can be practiced after other asanas had been done while lying on the stomach. It is a very good asana for beginners as it is simple and easy to perform. 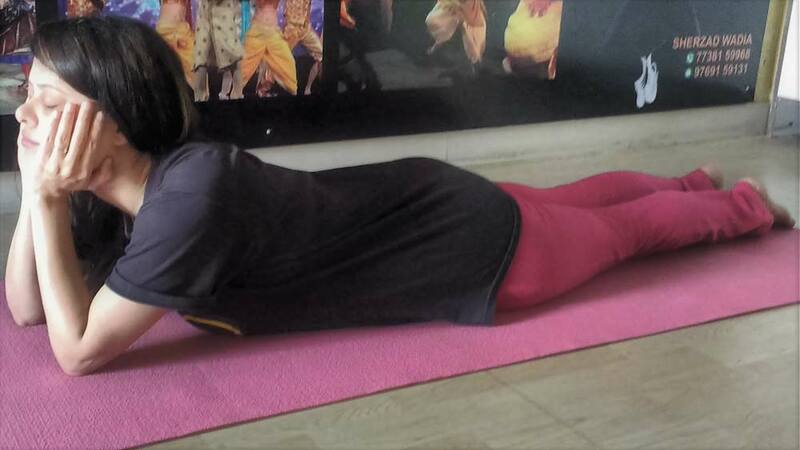 Bhujangasana is the backward bending pose that tones and strengthens the muscles controlling the spine. The spinal nerves, which emerge from in between the adjoining vertebrae, are decompressed by its practice. The deep and superficial muscles of the back are well toned up. The practice of Bhujangasana makes spine supple, strong and healthy. Every vertebra and its ligaments are pulled backward which ensures a rich blood supply. Ardha Shalabhasana massages the pelvic organs and improves blood circulation in the pelvic and lower back area. It is a very good Yoga Pose for people suffering from lower back pain and even sciatica pain. Ardha Shalabhasana, one of the best back exercises, strengthens the lower back muscles. The Ardha Shalabhasana is very good for people recovering from the slipped disc. its other benefits include improved digestion, healthy knees, and balanced autonomic nervous system. Setu Bandhasana strengthens the back muscles and hence is very good for people recovering from a slipped disc. This Yogasana gives an immediate relief to people suffering from back pain particularly the lower back pain. Setu Bandhasana improves the flexibility of the spine. Pawanmuktasana is very effective in removing the wind and constipation by massaging the abdomen and the digestive organs. It relieves indigestion, bloating, flatulence and acidity. Pawanmuktasana strengthens the lower back muscles and loosens the vertebrae of the spinal column and is therefore helpful in recovery for the people suffering from disc disorders. Tiredness and tightness in the lower back zone are relieved by the practice of Shava Udarakarshanasana. Shava Udarakarshanasna is very good for the back pain, particularly the side back muscles pain, that may come through continuous sitting on a chair or while driving. In addition to it, Shava Udarakarshanasana helps remove the excess fats from the waist area. When it comes to back pain, prevention is key to a long and pain-free life, but listening to the body is also very important. It should be taken care that all the above-stated postures should be done without straining and limits of the body should be known before performing the asanas. 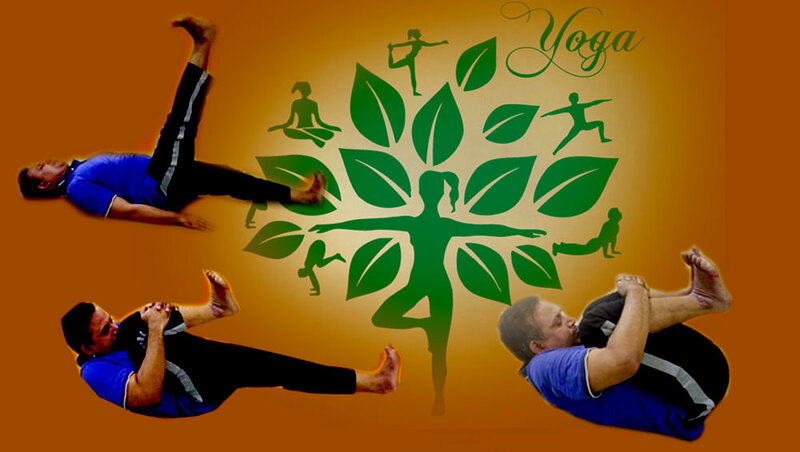 It is further advisable to do all the asanas under the supervision of a capable Yoga Instructor. If the pain is unbearable, it may be advisable to consult a medical practitioner, particularly in the case of slipped-disc or sciatic nerve pain the consent of Doctor is very important.